Park your car at N49 13.023 E6 57.078 (still located in Germany). The stash itself is located on the french side of the border. Don't take small children there. Best time to look for the cache probably on week ends. 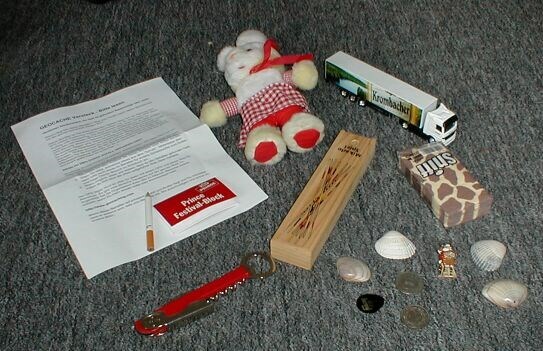 The cache contains: A stuffed Easter Bunny, a coca-cola Santa Claus pin, a bottle opener, a pack of paper handkerchiefs, a mikado game, some sea shells, a swiss 2 francs coin, a swedish 5 crowns coin, a toy truck and a plectrum (plus pencil and small log book). The cache is hidden under some mossy rocks. Fbzr fgrcf vagb gur jbbqf, ybbx sbe n fgenatr ohvyqvat. Ybbxf yvxr n fgbar tngr.